Craig Lynch, Maiden City Soccer Academy U14 manager. Maiden City Soccer Academy U14 side take on La Liga giants Valencia and Sevilla later this week. The teenagers will arrive in Roquetas de Mar on the south coast of Spain this evening and settle into their new surroundings for the next five days as they compete in the Torneo Internacional Roquetas de Mar from Thursday until Saturday. The under 14 squad will compete in the opening fixture of the tournament against former European Champions League finalists Valencia tomorrow (Thursday), in the 9,000 seater Antonio Peroles stadium which has just been fitted with a new 4G surface which was specifically laid for the start of tournament. The following day they have two fixtures, first up early in the morning is the renowned academy of Sevilla. Later in the evening sees the Maiden City players take on Almeria in their final group game. Saturday’s fixtures will start with the cup semi finals followed by place games. As well as Group A in which the Londonderry youngsters will compete Group B has equally as high profile participants with reigning La Liga champions and beaten Champions League finalists Atletico Madrid, Athletic Bilbao, Villarreal and the host club CD Roquestas. “This will be a fantastic opportunity for the players to compete against top class opposition with a different style of play as well as the chance to learn from the experience from small things like how the other teams approach the game, their attitude and behaviour around the hotel,” stated City manager Craig Lynch. The trip was made possible when three coaches from the Spanish FA, Rafael Perales Ruiz, Jose Antonio Garcia and Jose Angel Garcia visited Maiden City Soccer Academy for the month of October as part of an educational programme in conjunction with Foyle International language centre. The coaches spent time in the North West with the MCSA coaches observing and delivering sessions in both the community and academy programmes. The Spanish coaches we’re very impressed with the similarity in methodology and style of play between MCSA and their own clubs back home which is the reason for the invite. The players and staff at MCSA would like to thank Jose Antonio Garcia and his club CD Roquetas for their invitation and help with attending the tournament. They would also like to thank all the parents for the extra effort in getting the players to the extra sessions in preparation and also thank Kyle Wallace and David Campbell of Aspire Fitness who aided the players with their physical development over the past three months. Information from the tournament can be found on the competition’s Facebook page. Meet the Maiden City Soccer Academy squad, which will be playing in Spain this week. The 18 man squad travel today before kicking things off tomorrow. 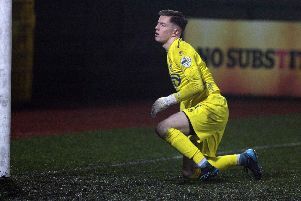 Ben Mills (Goalkeeper) - An important character in the dressing room, an excellent shot stopper with good distribution. Ross Barr - Attacking full back who is very useful at both ends of the pitch. Conor Polley - Athletic and intelligent full back comfortable on either side. Tom King - Commanding centre back who has had an excellent season. Dale Armstrong - Pacy forward who can both make and score goals. Matty McGarrigle - Creative attacking midfield player who works hard for his team. Ben Buchanan - Converted to centre midfield this season, has an excellent football brain. Luke Toland - Plays with an abundance of energy starting attacks and winning the ball back high up the pitch. Jamie Robinson - Tough tackling ball playing centre back, a real danger from direct free kicks. Jordan O’Doherty - Tall ball playing midfielder with an eye for a pass. Tom McLaughlin (Captain) - A real communicator and organiser with a big heart and pace to match. Tyler Toland - Ball winning midfielder who makes her team tick in possession. Aaron Rush - Small player with a big spirit and huge personality. Cathel O’Kane - Gives the team something different with his presence when in the mood. Dylan Martin - Bases his game on Neymar with the pace, dribbling and skills to match the Brazilian. Jordan Nugent - Old fashioned winger who likes to take on his full back and get crosses in. Andy Whiteside - Fellow Coleraine Academy team mate who will give City a physical presence and goal threat during the tournament. Richard Purcell (Goalkeeper) - Coleraine Academy net-minder with a really safe pair of hands who is guesting for the competition.